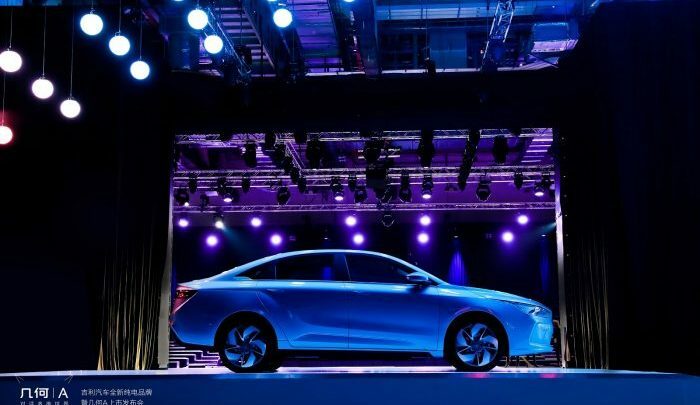 Geely Auto Group has launched a pure electric brand Geometry and its first model Geometry A at Singapore. The high-end model comes in two versions, standard range and long range, in a total of six different configurations. With Geometry the company aims to develop exclusive platforms, distribution channels, and products, in the field of new energy vehicles. By 2025, the company plans to launch 10 pure electric models in multiple segments including sedans, SUVs, crossovers, and MPVs. Geometry A, according to the company, will redefine the standard for pure electric sedans with its offerings. It comes in two versions, standard range and long range version which use CATL ternary lithium batteries that respectively have a capacity of 51.9kWh and 61.9kWh. The company states that the standard range version achieves a combined urban & highway NEDC range of 410km, while the long range version achieves a combined urban & highway NEDC range of 500km, meeting range anxiety. The car consumes an average of 13.5 kW•h per 100KM traveled. Based on the price of electricity in Beijing, 1KM would cost just .07 RMB (USD $.01) and a daily 30km commute would be less than 2 RMB (USD $.30). In order to ensure the efficient operation of the permanent synchronous magnet motor, Geometry A uses Geely New Energy “Intelligent Power” technologies which includes an intelligent high-efficiency electronic control system, HEDS High-efficiency electric drive system, lightweight high energy intelligent battery system, and ITCS Intelligent Battery Temperature Control System. Continuous monitoring of the battery system and motor ensures smooth energy output while the intelligent temperature control system ensures efficient battery performance in any weather. The powertrain system provides a maximum power of 120kW and maximum torque of 250 N•m allowing Geometry A to reach a speed of 100km/h in 8.8s. To allay concerns related to safety, model comes equipped with a unique MOD front and rear moving object detection system, RML intelligent driver seat pre-tensioning seat belt, and other active and passive safety features. Comprehensive configuration of active and passive safety features provide users with all-round protection. In terms of active and passive safety, Geometry A is equipped with Bosch 9.3 ESP system, AEB-P Automatic Emergency Braking with Pedestrian Detection, IHBC Intelligent High-Beam Control System, CVW Collision Warning System. In terms of battery safety, Geometry A carried out rigorous testing in seven extreme situations in accordance to national standards and regulations such as collision, extrusion, impact, submergence, extreme temperatures, puncture, and vibration. It can achieve L2+ intelligent drive using multiple high-resolution cameras and millimeter wave radars. It also offers AEB-P Automatic Emergency Brake with Pedestrian Recognition and full-speed ACC intelligent adaptive cruise control at speeds up to 150km/h. Rear and side radars allow Geometry to offer RCW/FCW Front/Rear Collision Warning, DOW Door Open Warning, LKA+ Lane Keep Assist, BSD Blind Spot Detection, LCA Lane Change Assist, and ACC S+G Adaptive Cruise Stop and Go. The comprehensive camera and radar configuration allows the car to see and track objects all around the vehicle. For added convenience, Geometry A also comes with APA one-button intelligent automatic parking system, 360° Panoramic Reversing Video, an intelligent in-vehicle system and voice assistant, and HD driving recorder.